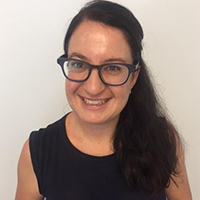 Gabi Salamon is a Paediatric Speech Pathologist with over 20 years of clinical experience, working with children aged between 18 months – 12 years. She enjoys working with preschool and early primary school children who present with a range of speech and language difficulties. In her career, she has worked in two of Sydney’s major teaching hospitals, Sydney Children’s Hospital and Royal North Shore Hospital, where she has held the positions of Senior Speech Pathologist and Team Leader. Her background of community health, school and preschool based services and areas of disability, means she can provide a thorough and holistic service to clients with a range of communication difficulties. Gabi is committed to ongoing professional development and evidence based practice. She has extensive experience in early language development and intervention, phonology, articulation, dyspraxia, stuttering, school age language difficulties and pre-literacy skills. Gabi strives to provide an individualised, engaging and evidence based service for her clients. She works collaboratively with teachers and other health professionals to achieve effective outcomes.